SNS Pink & White Nails dipping powder have no liquid, odor, UV light or primer. Unlike gel or acrylic nails, SNS creates healthy nails. SNS Nails are much easy to do, very thin and most importantly, help your clients’ nails grow healthier and stronger by the Vitamins and Calcium that is added to their product. SNS Pink & White Nails dipping powder have no liquid, odor, UV light or primer. Unlike gel or acrylic nails, SNS creates healthy nails. SNS Nails are much easy to do, very thin and most importantly, help your clients’ nails grow healthier and stronger by the Vitamins and Calcium that is added to their product. Evolution Salon and Spa is the best beauty Salon in the Oviedo Florida area. As a Full Service Salon and Spa we blend the high energy of a hair salon, the calmness of a Day Spa, the transforming services of a med spa. 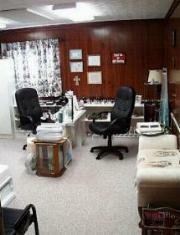 Evolution Salon and Spa is the best beauty Salon in the Oviedo Florida area. As a Full Service Salon and Spa we blend the high energy of a hair salon, the calmness of a Day Spa, the transforming services of a med spa.